These are the kind of headlines I would except from Kabul, the city where I currently enjoy political instability, city-wide lockdowns, vehicle born improvised devices and the likes. These are not the kind of headlines I would expect from my beloved home, HONG KONG, safest and most stable city in the world!! Why is this happening? Recently, Beijing issued a statement saying that THEY will choose the candidates to go on future ballots, that they will have veto rights over who gets “elected.” Essentially, Mainland China is ruling out our democracy. We already have extremely limited suffrage, and this further diminishes our rights, and swallows us more and more into the gaping maw that is the PRC. 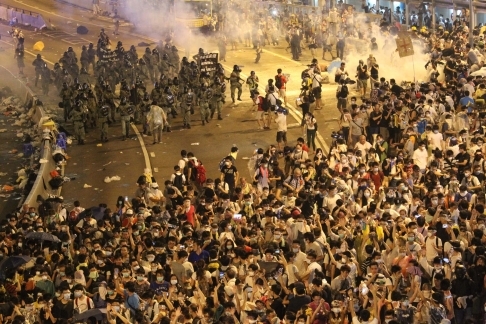 Hong Kongers are peaceful people, and we love our city. For us, protesting is a way of life. It is one of the things that makes Hong Kong so great- we are able to voice our opinions without fear of oppression from the government. But tonight, protests have turned ugly, with police firing tear gas and pepper spray into the crowds of thousands, with a constant rumour of guns (rubber bullets, let’s hope) to follow. 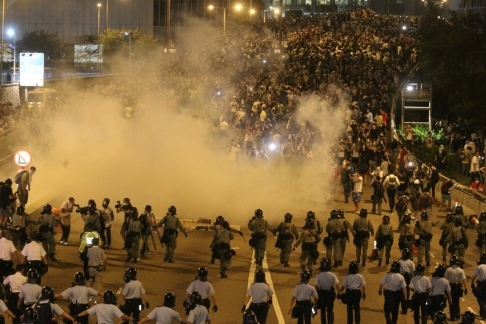 I have been glued to the live feed on http://hongwrong.com/occupy-central-live/ since getting home from work. It is so surreal, to be sitting here in an ACTUAL CONFLICT ZONE, watching live footage of the unfolding chaos like I would watch in an action film. The thing is…. it’s not a movie, it’s my home, and it’s happening live. 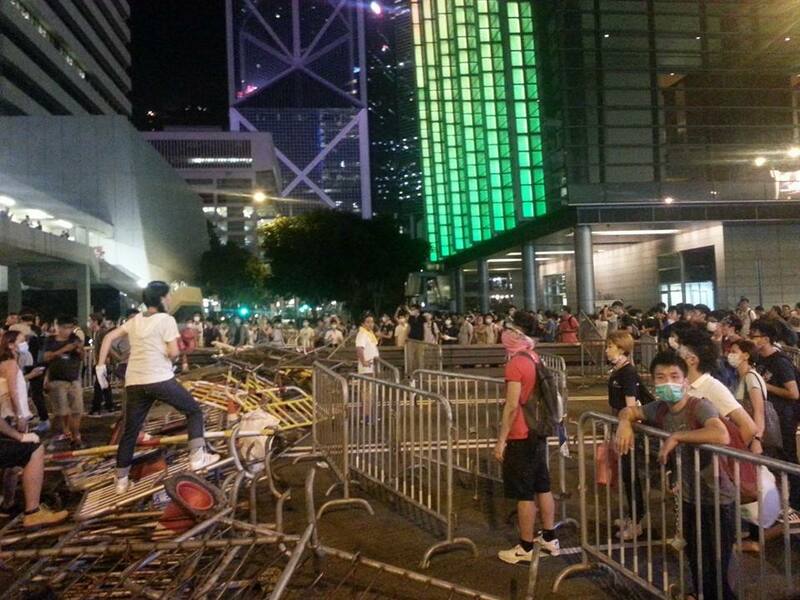 Scenes of the Admiralty MTR piled high with garbage cans, cordons, and barricades; footage of police in riot gear shooting pepper spray and tear gas into crowds of unarmed students with their hands in the air, reports of my friends getting hit with tear gas canisters; whatsapping with friends on the ground, listening to thousands of my HK compatriots singing “Do you hear the people sing” and “Beyond” through the Hong Wrong live feed……. I am overcome. I am so frustrated to be in Kabul, and not in Hong Kong right now. I feel helpless that I am not there with my friends fighting for our democracy, for our votes, for our rights, for our voices. Something significant resonate strongly with me. This protest started days ago, and yet, every piece of footage shows protestors with their hands raised and open, no rioting, no aggression, no looting, no violence whatsoever. You will never find a more peaceful protest. 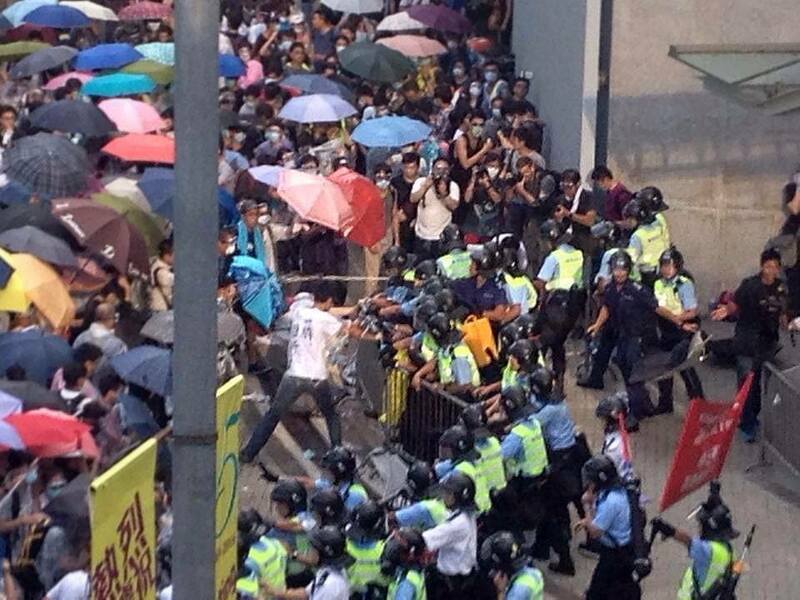 Hong Kongers just want freedom. 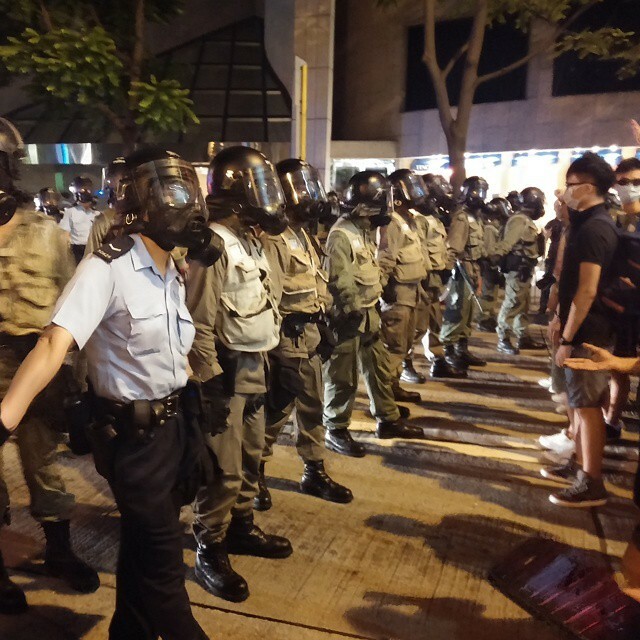 On the other, coming from the Kabul perspective, a city where I regularly see pickup trucks full of police carrying automatic weapons, where I have to avert my eyes at traffic checkpoints, where at any moment those who keep order here can become perpetrators, it should to be noted that the Hong Kong police are actually showing a great deal of restraint. The whole situation could have escalated way further than it has, and although I am horrified to see my city imploding the way it is, I am grateful for the control thus far. I just pray it doesn’t go any further……. 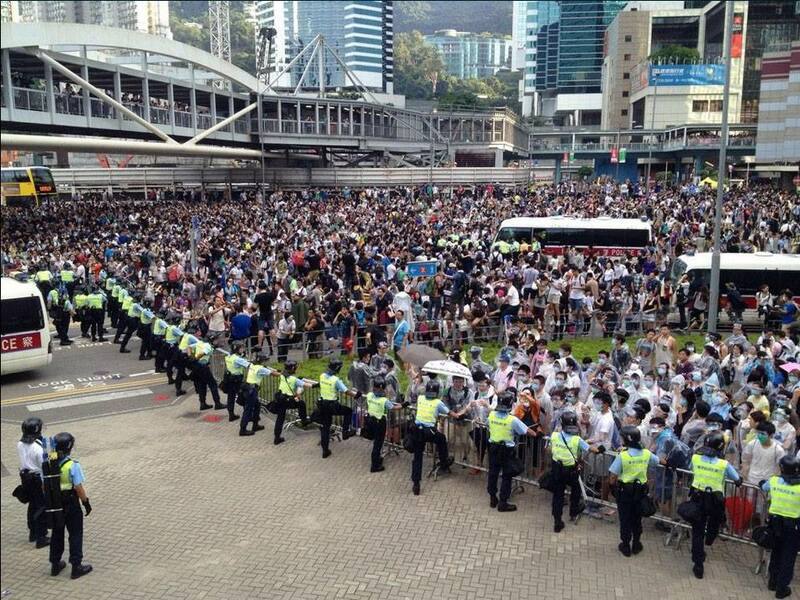 This movement in Hong Kong…… is not just important for Hong Kongers. This is important for everyone who lives in the territory- local and expat alike. This is important for Taiwan. This is important for Macau. This is important for DEMOCRACY IN GENERAL. Can the world sit by and watch a peaceful and wildly successful, autonomous, first world territory have its rights taken away? MEANWHILE, Afghanistan is poised just hours before the inauguration of our new president, in the first ever democratic handover of power in the country. Ashraf Ghani won 55.27% of the vote, but sadly has to share the power with Gul Marjan Double Abdullah, in a deal that has been met by heavy sighs across the nation. Afghanistan has been crippled for six months by these election processes and recounts and withdrawals from the audit process, so the unsurprising results were met not with the bang that some suspected, but by the whimper they deserved. And just a few hours ago Mr. Gul Marjan ye na mani threatened to boycott tomorrow’s inauguration!! Let’s see what, if anything, happens tomorrow in Kabul, my other home.